The Follicular Unit Hair Transplant surgery realised by Dr. Jório Santana is the most effective solution for baldness. Hair restoration surgery offers one permanent solution. Effective medical treatments are now offered in the form of a pill (Finasteride), a lotion (Minoxidil) or dietary supplement. Dr. Santana performs the best surgical treatment for hair loss. It’s called follicular unit transplantation. When performing this treatment, the surgeon reorganizes the follicular units transplanting from one region of the head or body, to another. This technique includes individually preparing the follicular units using a microscope. The great advantage of this approach is that the natural characteristics of the hair is maintained – enabling very natural results in both how the hair looks, and how it grows. The hair transplantation procedure normally takes from 3 to 5 hours and is performed in a hospital under local anesthetic and sedation. The patient is released approximately 3 hours after the surgery, on an outpatient basis. A highly qualified and experienced surgeon and team are needed to safely and successfully perform the procedure and ensure no damage to the follicular unit. When the procedure is complete, a cap is placed over the patient’s head to ensure the grafts are kept snug and secure overnight. This is removed by the patient 24 hours after the procedure, according to medical instructions. Stitches are used on the donor site for a period of 10 to 12 days. 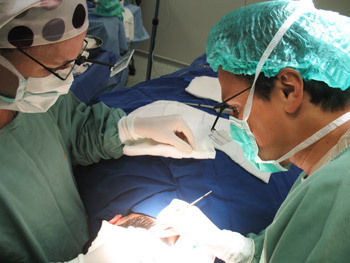 The procedure is begun by removing a strip of permanent hair-bearing skin from the donor area – on the back or sides of the scalp. 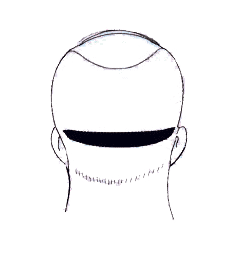 The strip with the follicular units (FU) is then dissected into multiple individual follicular units, a process done using a microscope to ensure the precision of the procedure and no damage to the FU. After separation, the FU are placed one-by-one in the new region in which they’re required, using a very fine and delicate blade and with no skin removed. After positioning, the FU will stay in place through the tension of the skin at the recipient site, where no stitches are required. People with areas of scarring from injuries or hair loss after face-lifting procedures, and patients with unnatural results from previous hair transplantation surgery. Areas such as: eyebrows, beards, pubic area, armpits and chest. 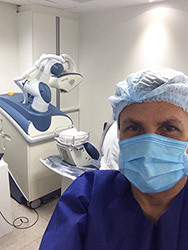 Dr. Jório has the robotic technology on his side while performing FUE procedures. The robotics was brought to Brazil by Grupo Sul Laser and was installed in a big medical complex of Rio de Janeiro. 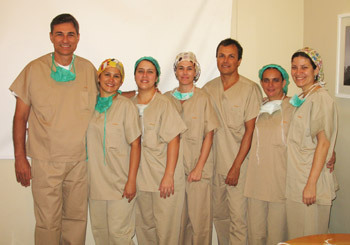 Dr. Jório Santana participated on a intense training in Centro de Medicina Capilar (Hair Medicine Center) to offer a very efficient treatment to his patients. Schedule an evaluation and ask questions about this new hair transplant method.